The EARLY WARNING SYSTEM signals traders of impending turning points in a stock’s trading trajectory. Red Dots (•) and Green Dots (•) indicate a high probability of a trend direction change occurring in a relative short period of time. The EWS Indicator generates signals by passing the current price through the result of a Laguerre filter. A Laguerre filter is an advanced calculation of a moving average. This calculation is then outputted as a static i.e., normalized horizontal line plotted at zero on the EWS chart. the array these bars produce to determine if EWS signals have been generated. LAUNCH PAD ~ Zero Lag Indicator, Swing and trend trading indicator provides a distinct advantage in determining trade direction changes. The moving average is converted into a striate line on the zero axis. Movement above or below this axis become divergence away from the current trend providing the trader with an immediate (zero lag) indication of the change in trader sentiment and price direction. The primary Entry/Exit signals are produced by a hybrid algorithm that utilizes multiple moving filters and oscillators, all working in concert. Three of these filters were originally developed and published by John Ehlers. The Center of Gravity Oscillator (COG) (Gold line in chart at right) was first published in Technical Analysis of Stocks and Commodities in it's May 2002 issue. COG produces a moving filter that heavily weights the most extreme and most current values in the stream of data within the window of the indicator. COG excels at determining and indicating where, within a parabolic path, tipping or turning points have occurred. As you can see in the chart on the right, short term COG oscillators do not produce smooth, typical, tight tracing moving average outputs. Instead they have the potential to quickly and accurately flag reversals by producing peaks at the apex and vertex of the extremes within the price action. It becomes relatively simple to confirm turning point occurrences because immediately after the deflection points, the price trend dramatically reverses from the prior slope or trend direction. Finally the Arnaud Legoux Moving Averages (ALMA) is utilized as smoothing filter to slightly shift the weighting from the COG Pass band filter, in a selective and adjustable manor to more current bars. This is desirable because COG dramatically emphasizes the most current candle or bar as well as large candles and strong deviations from within the moving average. Arnaud Legoux and Dimitrios Kouzis Loukas developed ALMA. It is a Gaussian distribution shifted filter with an offset that is not centered on the data’s window, but slightly shifted to the more (not the most) current data. ALMA performs better in our situation because it takes into account the fact that the closer you get to the most current data, the higher the uncertainty becomes. This is true in this case because the most recent candle or bar is the one most heavily weighted by the COG calculation and produces the most uncertainty about future direction. Of course we are also at a demarcation point between what is known and what is unknown. This offset is adjustable so the trader can balance between smoothness and responsiveness. The data window size is also adjustable allowing the amount of data included within the filter to be dialed in. The third parameter is sigma, which determines the filter’s shape and is also adjustable, enabling the trader to widen or shorten the filters focus. Another unique attribute of the ALMA filter is the removal of small price fluctuations, enhancing the trend by applying a moving filter twice, once from left to right and once from right to left. This process (Zero-phase digital filtering) reduces noise in the signal, further reducing phase shift (price lag) commonly associated with moving averages. The result of driving two lengths of Center of Gravity filters, with two different inputs, through a pass band filter and finally smoothing that reactive output by using an ALMA filter, provides the trader with excellent responsiveness within a very smooth output signal with very few artifacts or whipsaws, producing highly reliable trading signals that accurately indicate optimal entry and exit points. The ultimate advantage of the ALMA component of this filter is the ability it provides to traders, to adjust the data window allowing the primary entry/exit signals to be dialed in exactly at the optimal spot between the Early Warning Indicator dot and the Cross/Over dot. Because this system was initially designed for swing traders who’s time frame is normally a few days to a few weeks, the look back periods are short. ALMA greatly improves Swing•Genies ability to dial in these short time frame filters with as few whipsaw trade indications as possible. These same attributes also enable the day traders to alter trading time frames to very effectively utilize this indicator. All stocks produce parabolic swings using price and time to calculate and draw the arc's that lead to the pinnacle of the peaks and the absolute bottom of there troughs. This is regardless of the time frame you choose to trade in. When similar patterns recur at progressively smaller scales, they are identified as fractals. This fractal property of price and time in the stock market is what allows Swing•Genie to excel at identifying optimal opportunities within the Trend, Swing or Day trading time frames. Swing•Genie signals, projected on your main trading chart are generated in tandem within the Early Warning System and the Cycle Indicators. Slides can be advanced by clicking on the large slide, using thumbnails above or the "<" ">" controls provided at the left and right edge of each slide. Any technician attempting to forecast what future prices will be, is engaging in technical analysis, hocus-pocus. 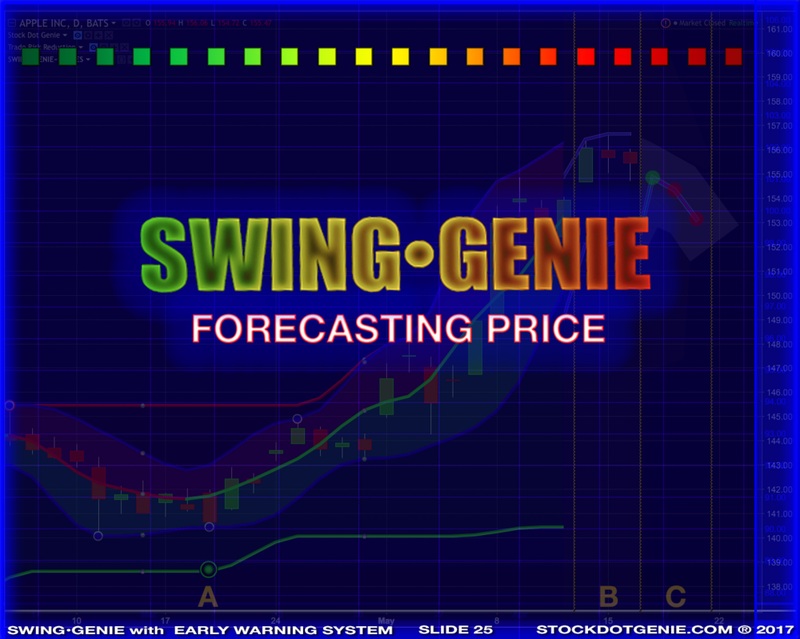 Current methods being utilized to accomplish some level of success in forecasting price are detailed in the TASC article describing the Swing•Genie indicator. It is, however, possible to simply project the current price action forward a few bars with the expectation that the current trend will continue on the approximate arc that is being fellowed by the equity. This provides to the trader a visual projection of the potential price action, but in no way is it any guarantee that prices will actually fellow this tract. The fellowing slides provide a detailed explanation of how Swing•Genie price forecast is calculated so that the trader can understand exactly what credence and confidence to give to them. Hurst Laguerre channels are also touched on in the following slides. For a complete Hurts cycle explanation, scroll down this page to a dedicated slide. 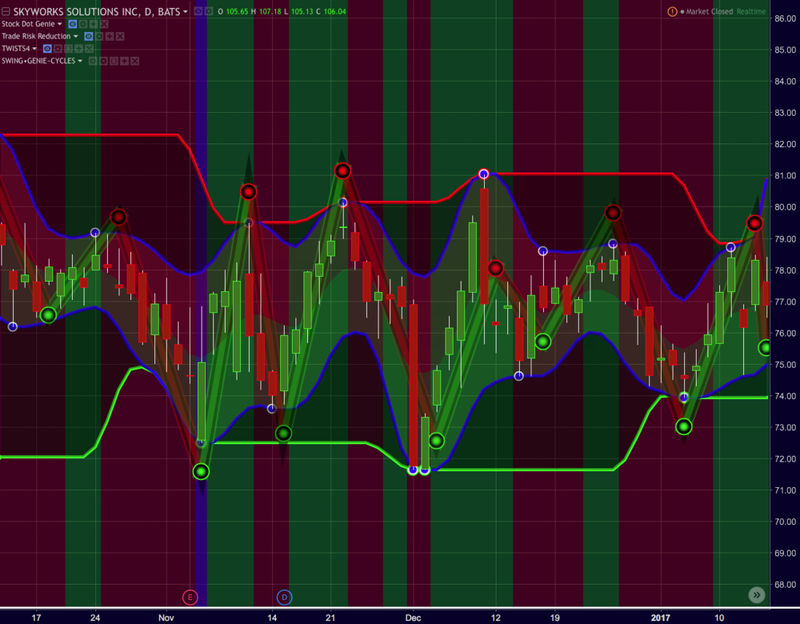 JM Hurst developed a trading system (Hurst’s Cyclic Theory) to clearly display the cyclic harmonics that exist within multiple time frames. Hurst theories attempt to deconstruct the fractal hierarchy of an equity and determine alignments and convergences. He produced two books on this system in the 1970's and several books have been authored by individuals who were advocates of Hurst's published theories. Many trading message boards have threads on Hurst cycles with multiple descriptions of various methods to calculate, code and execute trades based on signals generated by these indicators. In addition, many institutions and hedge funds incorporate some version of Hurst cycles into their trading protocols and algorithms. The primary principals of Hurst cycles are price moves in waves (See illustration above) that exhibit cyclic attributes based on their time scales. Although the concept may seem simple, the execution utilizing the lessons and incorporating the finer points from Hurst's second book, "Cycles Course," can be very difficult to correctly and profitably apply. Strong signals are generated by Hurst cycles when cycles of different lengths have peaks or troughs that converge. There have been many different attempts at executing Hurst cycles as a Technical Indicator. 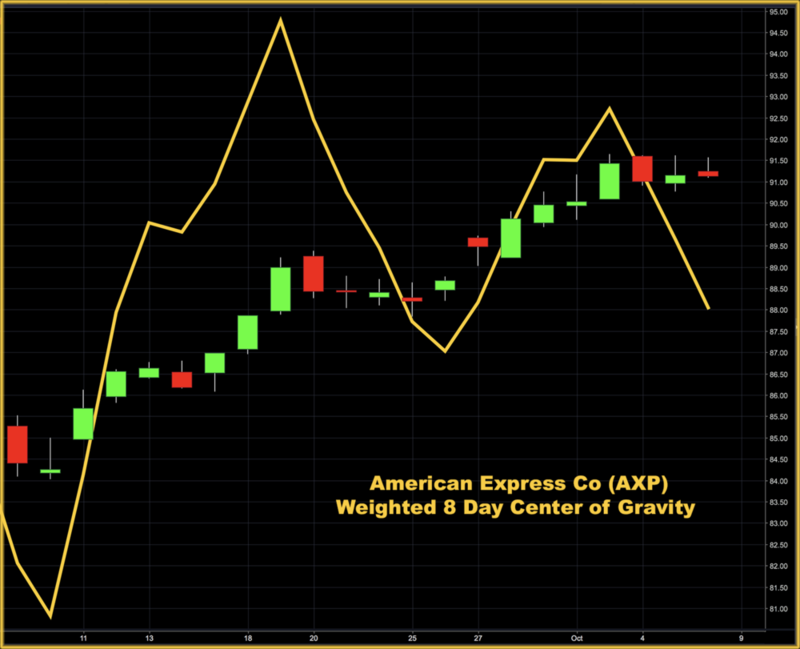 Most of those attempts have been centered around displacing moving averages backward to center or align the different lengths so that the troughs and peaks align with the highs and lows of the current stock cycles or swings. This displacement is usually 1/2 of each of the moving average lengths utilized. This produces a setback of the active signal causing it to end many bars prior to the most current bar. Because this ends the moving average indicators signals as many bars back as the displacement, no current or real time indication is provided. With prior cycles highs and lows as a guide, combined with the current trend, an artificial signal can be produced, projecting the indicator forward. This determines the current trend based on the last X number of price points in the chart starting where the indicators setback ends. Swing•Genie Cycles incorporates Hurst cycles theories but utilizes only two nested Laguerre moving filters. Laguerre moving filters have significantly less lag and the setback required is only three days/bars. These moving filters take as there inputs the highest high and the lowest lows for the two adjustable periods. The point of the indicator is to determine when a short term swing cycle harmonizes or aligns with a long term cycle, i.e., determining when the tops and bottoms of these cycles align. The default intervals utilized in Swing•Genie Cycles are short period of 5 days and the long period of 20 days. Each equity can have unique cycle lengths and the Swing•Genie Cycle Indicator allows you to change these parameters in the formatting/input pallets. Because the Swing•Genie Laguerre cycles utilize the highest highs and lowest lows of two time periods, the nested channels produce natural bounding boxes. This dramatically highlights likely support and resistance levels as they often occur at prior highs or lows that this indicator is drawing. This provides the trader with a high probability gage of the profit that can be expected from your entry into a trade executed at these demarcation lines. If the entry point is at the shorter interval, then the upper limit of this trade in likely to be the upper band of the short term channel. If the entry is at the convergence of both the short term channel's lower band and the long term channel's lower band then your trade potential is the high band of the long term channel. This inflection point is obviously stronger and results in a much higher probability of success and more sustained and profitable entry positions. This obviously produces another indication that your trade may be approaching an inflection point and turn against you as you approach the upper demarcation lines. Every time the high or low of the bar touches either bands, top or bottom, an intersection dot is produced. These dots are blue/white if they are touching the inside 5 bars band and red/white/blue or green/white/blue if they are touching the upper or lower, 20-day bar, longer length time period channel. These double dots produce entry and exit signals with the greatest potential. The exception to this statement is when stocks are very strong trends and continually bounce off of the upper or lower limits of the long term channel. Closing Score Sentiment allows you to turn on the color coded background you see below. Red will coincide with a negative trend and green indicates a positive trend. Each is indicating what the prevailing market/trader sentiment currently is. You can read a complete explanation of Closing Score Sentiment here. The control panel allow you to control the intensity of these sentiment background flags.